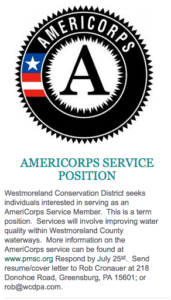 The Westmoreland Conservation District is accepting applications through July 25th from individuals interested in serving as an AmeriCorps Service Member. This is a term position involving conservation and outreach for the Westmoreland Conservation District and support of the Westmoreland Land Trust. More information on Americorps service can be found at www.pmsc.org. Send resume/cover letter by July 25th to Rob Cronauer at 218 Donohoe Road, Greensburg PA 15601; or rob@wcdpa.com.